Learning How to Paddle Board is Not as Hard as You Think! If you want to learn how to paddle board then the information below should help you to get going quickly. I’ll start by saying that you should select a location with very calm water and no wind or currents for your first time out, this will make your learning experience easier and you’ll have a much better chance at success. I figured I’d go with a Q & A format since that’s how I like to break things down into manageble chunks of information…so let’s learn how to paddle board! Q: How do I carry my paddle and board to the water’s edge? A: Most boards have a recessed handle in the middle of the board that is at a balanced position. Hold the board against your strong side (right for right-handed, left for left-handed) at your waist-level by the handle. Carry the paddle in your other hand. To keep the leash out of the way while walking you can wrap it around the board near the fins. Some boards have carry-loops instead of a built in handle, with these you should feed the paddle shaft through the loops and use the paddle shaft itself as the carry handle. Some few boards don’t have any carry handles, with these boards you should be able to tuck the board under your straight arm (board tight up to the armpit) and grip the bottom edge with your fingers. 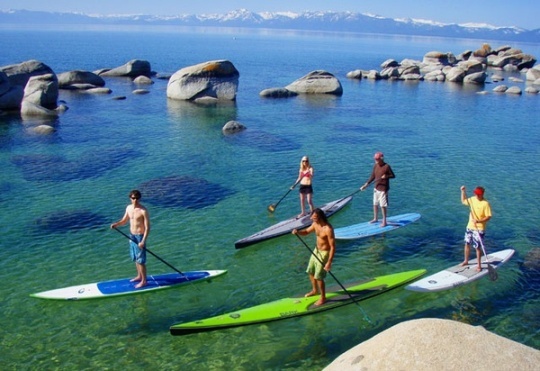 Q: How do I get on the paddle board once I’m in the water? A: Once you’ve waded into water that’s about knee-deep, place your paddle on the board the long way with the handle on the front of the board and the blade slightly in front of the middle of the board. If you need to push the handle grip well in front of the board, that’s fine. In this one situation, it’s okay to position the bend in the paddle facing upward, to keep the paddle from coming off the board as easily. Generally you don’t want to do this because any weight or pressure on the “joint” of the paddle at the bend can cause strain on the paddle. Once your paddle is in position, grab the board edges just in front of the center of the board and climb onto the board with your knees place near the right and left sides of othe board’s width at the center (front to back). You should be in a kneeling position near the center of the board now, with the paddle just in front of you. Go ahead and grab the paddle and hold it like you would if you were canoeing. At this point you can take a few strokes on your knees to get the feel of it, this technique of paddling on my knees really helped me get the feel for the board when I was learning how to paddle board in the beginning. Q: How do I stand up on the paddle board? A: By now you should be in the water on your knees with the paddle in your hands. Next you should turn the paddle so that the bend in the shaft causes the blade to point toward you. Place both fists on the board about a foot in front of your knees near the edge of the board, you should still have the paddle in both hands across the board. Now slowly walk your feet one at a time into a squating position with your fists still on the board in front of you. You should now be in a position with only your hands and feet touching the board. Next stand up slowly while continuing to hold the paddle in front of you, it can help with balancing to a certain degree also. Once you’re fully standing, remember to keep your knees slightly bent and use your hips to counteract and balance any side to side wobble. Learning to manage the side to side wobble of the board is the key to staying upright at this stage of learning how to paddle board. Q: How do I hold the paddle? A: One of the most often made mistakes when learning how to paddle board is holding the paddle backward, with the bend facing toward the back of the board. There is a bend in all stand up paddles just above the paddle blade. This bend should be positioned so that the paddle tip is angled slightly forward when the paddle is held vertically. The reason for this is to increase leverage and keep the paddle perpendicular to the water throughout more of the stroke. This means more power and efficiency. The “T” grip on the top of the paddle should be held with the palm on the back of it with the fingers warpped over the top. Your other hand should be somewhere on the upper-middle of the shaft, you should position it where ever it’s comfortable for you. Q: How do I start to paddle? A: Once you’re in the standing position with the paddle in-hand, slowly place the paddle blade into the water to the front and side of the board about 3/4 of the way up. Pull back on the paddle shaft while pushing forward with your upper hand. Think of your paddle shaft as a lever with your lower hand as the fulcrum. The only difference here is that you can also move the fulcrum (your lower hand) backward at the same time to increase your speed and power. Normally your board will immediately start to turn to the opposite side that you’re paddling on, especially if your paddle is not right next the board during the stroke, to travel in a straight path alternate sides of the board that you’re paddling on. Make sure to switch the position of your upper and lower hands on the paddle when you change sides. If you’re paddling on the right side of the board, your left hand should be on the top of the handle and the right hand should be in the middle; the reverse of this if you’re paddling on the left side (right on top, left in the middle). You will find fairly early on when learning how to paddle board that you have a dominant side that feels more natural and powerful, for myself this is with the paddle to the left side of the board (I’m right-handed). Q: Where should I look while paddling? A: Another common mistake people make when learning how to paddle board is looking down at their feet. In general, looking at the horizon while paddling will help you to maintain your equilibrium better than looking elsewhere. Obviously, there are times when you must look down, such as checking the position of your feet on the board, etc., but most of the time you should be looking out toward the horizon in the direction you’re moving. Q: It seems that I keep turning when paddling, what’s wrong? A: When you’re learning how to paddle board, you’ll usually find that you can only take a few strokes on each side of the board before you have to switch to the other side. This is common, so don’t worry. Here are a few tricks to help you keep the board moving in a straight path. First, keep the paddle close the side of the board and as verticle as possible. This will help minimize the amount of sideward force on the board the keep you moving forward. Secondly, keep a slightly greater percentage of your weight on the same side of the board as your paddle. For example, if your paddling on the left, then “push” down slightly with your left foot. This will help to direct the board to the left.